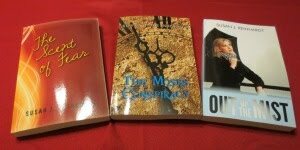 Christian Writer/Reader Connection: On My Nightstand - The Father Christmas Confessions - FREE DOWNLOAD! Thanks for hosting and posting this information. Interesting! I didn't know you could make a word doc into kindle format. Wonderful interview! Thank you, Susan and Emily, for doing it. I learned a lot. :) I am looking to convert a booklet into an ebook in the coming year, so this will come in handy! I learned some things about e books today. Hi Jess - That was also news to me. Karen - I'm so glad the interview was helpful. I thought she did a great job simplifying the process. Hi Loree - Yay! I thought this would be a neat interview. Interesting. Not having a Kindle yet, it's a (brave) new world out there for this girl. I feel like the 5-year-old just starting the minnow classes at the swimming pool. LOL. Time to learn, though. I also downloaded it to my PC. I read one chapter. Can't wait to get back to it.